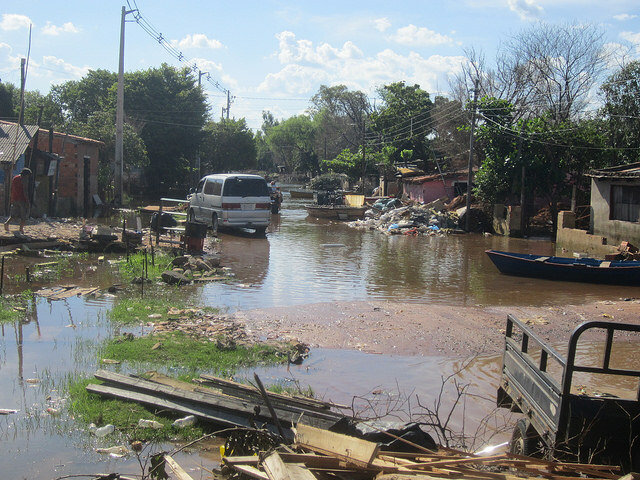 ASUNCION, Paraguay, Apr 1 2016 (IPS) - Néstor Colman, 69, remembers the river overflowing its banks nine times in Bañado Sur, the poor neighourhood in the Paraguayan capital where he was born and has lived all his life. “A record,” he jokes. He is one of the oldest in the improvised shelters of huts made of thin, fragile wood built in city squares, streets, sports fields and any empty space in Asunción, which since November have housed the people displaced by flooding from the low-lying neighbourhoods lining the Paraguay river. With his guitar hanging off his shoulder and cracking jokes, Colman appears to have resigned himself to the crisis affecting the more than 100,000 inhabitants of the “Bañados” – a string of riverside neighbourhoods on boggy land along the river, where one-fifth of the population of the capital live, mainly migrants from rural areas. “I play and sing as a volunteer in Catholic churches in six or seven communities,” he told IPS, to explain why he was carrying a guitar. To earn an income, he expanded his small hut to include a kiosk, where “I sell everything, except alcoholic drinks, because otherwise they come and drink a bottle, and you can’t get them to leave,” he said. Colman, who has one daughter and two grandchildren, “all of them from the Bañado,” has been fighting for five years to secure a retirement pension, since he fell off a roof and hurt his back. 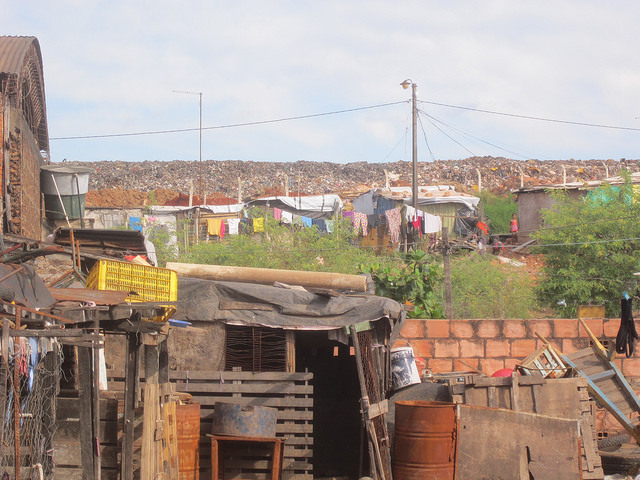 Bañado Sur, a large stretch of low-lying land between the city and the river, was home to just a few families until around 30 years ago, “when many people came, to make a living from the garbage dump,” Colman said. 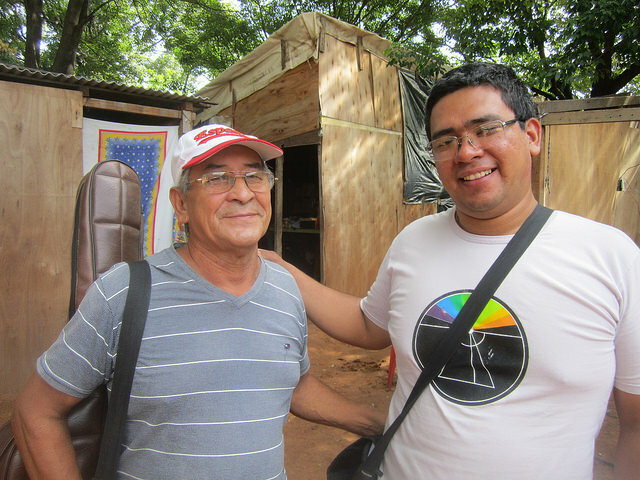 The area is a huge open-air dump where thousands of garbage pickers or “gancheros” have permits to pick through the trash for objects of value or recyclable materials, said Cleto Pérez, one of the founders of the 1811 Movement, created by young people from Bañado Sur. The name of their organisation includes the year of Paraguay’s independence from Spain. 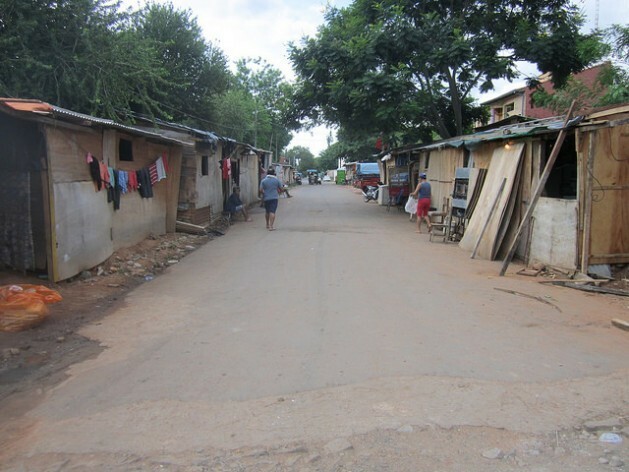 A large part of the local population in Bañado Sur are either gancheros or “recyclers”. The latter collect recyclable materials on the streets, said Pérez, another of the evacuees interviewed by IPS, while the former have to pay nearly 600 dollars for a permit that allows them to sort through the rubbish in the dump. “The local residents here treat us badly,” complained recycler Edgar Acuña, referring to the middle-class families in the neighhourhood where the shelters for the displaced were set up. “I tell them it’s better for them that I’m working rather than stealing from them,” he joked. One complaint is that he piles cardboard, glass, plastic and metal on the sidewalk, since he doesn’t have the space he had in his house in the Bañado, where he stored the materials before transporting them on his motorcycle with a cart, to sell them. “We hold weekly meetings in the shelters to discuss things and set rules, like not playing loud music at night,” said Pérez. He said loud noise and drunkenness are the most frequent complaints by local residents in the neighbourhood where the two shelters were set up – one in the plaza, where 77 families are staying, and another in an empty field, with 56 families. “I came to the Bañado for just a short time because of my mother. Then she died and I stayed,” said Maria Nimia Falcón, who supports her four children weaving tapestries, tablecloths and other articles. She has been living in Bañado Sur for 12 years, since she came from Lambaré, a city to the south of Asunción. Her fear is justified by the continued threat posed by the El Niño-Southern Oscillation (ENSO), the cyclical climate phenomenon blamed for the heavy rainfall that led to the overflowing of the river since November. Meteorologists forecast further flooding “up to late July or early August,” according to David Avendaño, head of operations at the SEN emergency management agency. The more than 20,000 families who live in riverbank wetlands in Asunción are split between the Bañado Norte in the north, Chacarita in the centre, and Bañado Sur in the south. Of that total, 13,454 had to leave their homes and take refuge in 143 shelters, the SEN official told IPS. SEN was created in 2005 to manage disasters, and answers to the presidency in this landlocked southern cone country of 6.8 million people. Only a small proportion of the families lived in homes that went untouched by the flood waters, or were livable shortly after the water level went down, because of their location on ground that is higher but still vulnerable. Two decades without serious flooding encouraged rural migrants to build homes on even lower-lying land along the river, and prompted long-time residents to improve and expand their homes or buy more expensive household appliances – all of which made the losses even worse. The new cycle of floods began in mid-2014. And this year ENOS, which warms the waters of the Pacific ocean and affects weather around the world, led to intense rains and the overflowing of the Paraguay river since November, making life miserable for the riverbank dwellers. Benita Falcón had such a bad time in a shelter in 2014 that this time she decided to do whatever she could to stay in her neighbourhood, in a house on a spot of higher-lying ground, which has turned into an island. In the shelter, “people didn’t respect each other, and we’d go a week without clean water to drink, a working toilet or electricity, or a month without assistance from the government,” she recalled. “We use a boat to move around when we have to; we withstand storms, rains and snakes invading the house,” said Falcón, 48, who has six children and six grandchildren. She moved from Bañado Sur to Bañado Norte 27 years ago to live with her husband. Besides gathering recyclable materials on the streets, she raises pigs, chickens and cows. “The culture in the Bañados is a rural one,” she said. “There is no state policy for the Bañados, no disaster prevention; they already knew about El Niño and measures weren’t taken, shelters weren’t organised,” lamented Maria Garcia, “born and raised” in Bañado Norte. The 44-year-old mother of two is the local head of Cobañados, a network of 10 community organisations. Her house is still cut off by a flooded street, a few metres away from a pond that was once the community sports field. She has found shelter in the home of relatives in the neighbouring city of Loma. A definitive solution, he said, would be to resettle them elsewhere, such as in the municipality of Itauguá, 30 km southeast of Asunción. He announced that 1,000 housing units would be built next to the Botanical Garden on the north side of Asunción, with development aid from U.N.-Habitat and other United Nations agencies, the European Union and the United States. “But many people don’t want to leave the Bañado,” he added. Besides their discrepancies regarding official aid, Cobañados advocates the construction of the Coastal Avenue, which is 3.8 km long and is to be extended an additional 22 km, closer to the riverbank, to provide a kind of dike that would protect the Bañados. With floodgates and pumps, such as the systems used to reclaim land in the Netherlands and in other cities in Paraguay like Pilar and Concepción, neighbourhoods prone to flooding would be preserved, and it would be much less costly than filling in the wetlands, raising the ground and rebuilding everything, as the government is thinking of doing. The government’s proposal is not only costly but could push the local Bañados residents out to make way for the wealthy and for companies. But “it is not sensible, it would modify the ecosystem terribly,” said Elías Díaz Peña, head of the local environmental organisation Sobrevivencia (Survival).